You probably know that Thomas Jefferson wrote the Declaration of Independence, but how exactly did he go about it? How did he know what to say? How did his thinking on the matters of independence develop? You came to the right place to find out anything about Thomas Jefferson and the Declaration of Independence. Thomas Jefferson wrote the Declaration of Independence while he was renting a room in the home of a Philadelphia bricklayer. A replica of the original building, known as the Graff House, stands on the spot in Philadelphia and was built in 1975 by the Independence Hall Association. It is part of Independence National Historic Park and is managed by the National Park Service. You can visit this website to find out the visiting hours and directions. 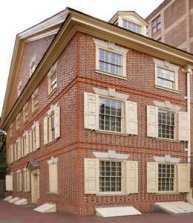 (The Graff House is known as the Declaration House on the NPS website). The original house was built in 1775 by a well known Philadelphia bricklayer named Jacob Graff, Jr. When Jefferson was asked to write the Declaration, he rented two rooms, a parlor and a bedroom, on the upper floor of this house to get away from the center of the city near the river. It's only a few blocks away, but it was on the outskirts of the town then next to a large field and a horse stable. He complained about the flies from the stable. Thomas Jefferson wrote the Declaration of Independence here in less than three weeks. Rebuilt: Rebuilt in 1975 using old photos of the original. The original house was torn down in 1883. The replica is a pretty exact recreation. This house was once owned by Simon and Hyman Gratz who were the brothers of Rebecca Gratz. It is believed that Rebecca was the inspiration for two famous novels - William Thackeray's "Rebecca" and Sir Walter Scott's "Ivanhoe." On May 15, 1776, the Virginia Convention was meeting in Williamsburg. They unanimously passed a formal resolution instructing their delegates to the Continental Congress to propose to the other delegates that the united colonies should formally and permanently break away from Great Britain because of the abuses they had suffered from the king. Read the text of the Virginia resolution proposing independence here. But wait, let's back up a little to 1775 to better understand Thomas Jefferson's views about independence. In April of 1775, news began to spread about the Battles of Lexington and Concord. British troops had attempted to confiscate American ammunition stores and capture patriot leaders in these towns. This was a pivotal event that stirred up American anger toward Great Britain. The Continental Congress had met in September 1774. They had sent a list of grievances to King George III hoping for a reconciliation. They agreed to meet again the following year if they did not receive a favorable response from the king and if circumstances warranted them meeting again. The king did not respond to the First Continental Congress' grievances and the events at Lexington and Concord united the Americans in their anger toward the king. In addition, a British army was massing around Boston. All of these events put together encouraged the colonists to schedule a Second Continental Congress. The Second Continental Congress held its first meeting in May 1775. 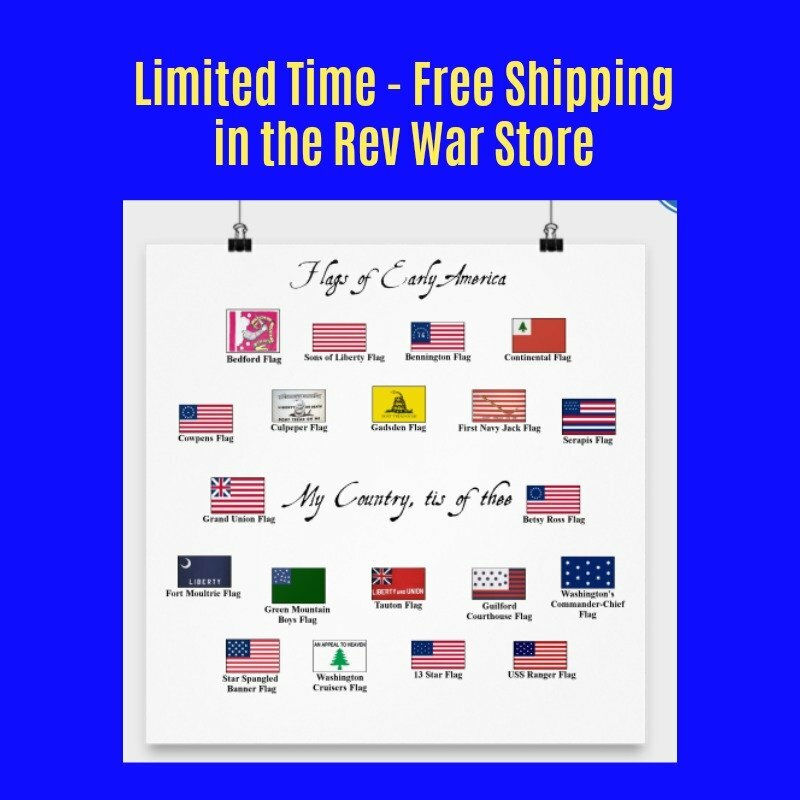 Knowing that a Continental Congress would soon be held, Thomas Jefferson drew up, on his own initiative, a set of resolves detailing British abuses, that he intended to give to the delegates from Virginia to the Congress. He became ill and sent the resolutions with Peyton Randolph to present to the Virginia convention under the title Instructions to the Delegates. The Virginia Convention consisted of the locally elected government officials who had been barred from meeting by the Royal Governor. They continued meeting anyway and began to form their own government, apart from the royal government for Virginia. Randolph presented Instructions to the Delegates to the other delegates, who generally agreed with them, but thought they were a little too boldly antagonistic to be formally accepted. Nonetheless, they published the resolves under the title A Summary View of the Rights of British America. This document lays out Thomas Jefferson's views about why the American’s had the right to declare independence from Britain. It is certainly one of the documents that Jefferson drew from when he wrote the Declaration of Independence. Read the text of A Summary View of the Rights of British America here. 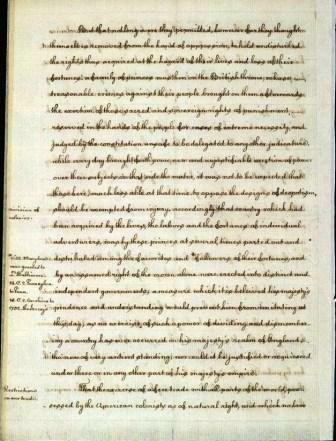 This is a picture of the actual manuscript Jefferson gave to the Virginia Convention. Copies of A Summary View of the Rights of British America were printed and widely distributed and this was part of the reason that Jefferson was eventually chosen to write the Declaration of Independence. By the following year, when the Declaration was written, many of the other delegates at the Second Continental Congress had already read it and thought the language and style was so eloquent that they wanted Jefferson to use his writing talent in expressing their own Declaration. Another important document that Thomas Jefferson wrote that foreshadowed the Declaration of Independence was a draft of a Constitution for the State of Virginia. After the Virginia Convention voted for the independence resolution on May 15, 1776, Jefferson immediately wrote up three drafts of a constitution for the state that would soon be formed. This document is important because it expresses many of Jefferson’s views on independence only a few months before he wrote the Declaration of Independence. 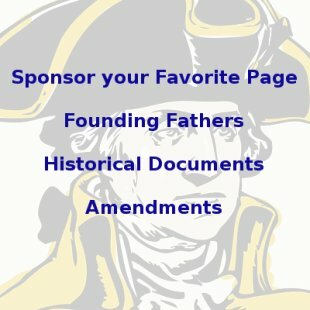 You can read the text of Thomas Jefferson’s draft of a Constitution for the State of Virginia here. 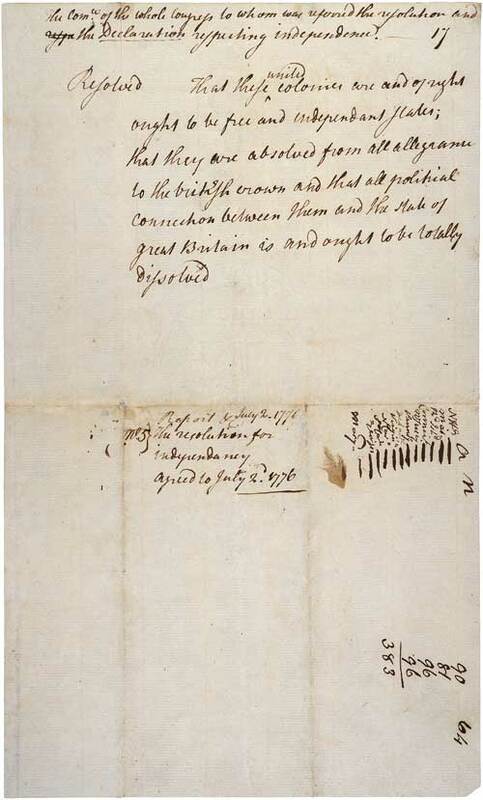 "Resolved, That these United Colonies are, and of right ought to be, free and independent States, that they are absolved from all allegiance to the British Crown, and that all political connection between them and the State of Great Britain is, and ought to be, totally dissolved. That it is expedient forthwith to take the most effectual measures for forming foreign Alliances. That a plan of confederation be prepared and transmitted to the respective Colonies for their consideration and approbation." Congress postponed debate on this resolution until the next day, June 8th. In general, many of the delegates from the central states felt that their inhabitants were not yet ready to declare independence, but thought they would be soon. So, by June 11th the Congress took a vote on whether or not to vote on the matter of independence now or to wait until later. The decision came out 7 colonies against 5, with New York abstaining, to push the vote three weeks later to July 2. Since the tone of the meetings in early June indicated that the full Congress would probably be ready to make a vote in favor of independence by July, they formed three committees to work on the three proposals in the Lee Resolution during the break. 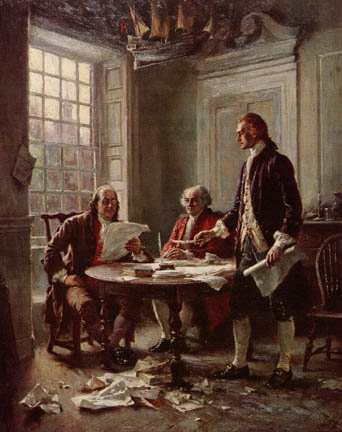 Thomas Jefferson, Benjamin Franklin, John Adams, Robert Livingston and Robert Sherman were appointed to the committee that was responsible for writing a draft version of a formal Declaration of Independence. Once their committee had met, these five appointed Jefferson to write the actual document because he was an eloquent writer, because he was a Virginian, and it was important for this leading state to appear to be in the forefront and because Jefferson had a favorable reputation, whereas John Adams was viewed as a firebrand and was not liked in many circles. Allegedly Thomas Jefferson tried to get him to write it instead. The conversation went on, in the words of John Adams in an 1822 letter to Timothy Pickering, like this, 'I will not,' 'You should do it,' said Jefferson. 'Oh! no.' 'Why will you not? You ought to do it.' 'I will not.' 'Why?' 'Reasons enough.' 'What can be your reasons?' 'Reason first, you are a Virginian, and a Virginian ought to appear at the head of this business. Reason second, I am obnoxious, suspected, and unpopular. You are very much otherwise. Reason third, you can write ten times better than I can.' 'Well,' said Jefferson, 'if you are decided, I will do as well as I can.' 'Very well. When you have drawn it up, we will have a meeting.'. It was at this time that Thomas Jefferson actually began work on the Declaration of Independence. Not only did he refer to his own A Summary View of the Rights of British America, and his own draft for a Virginia state constitution, but he also relied heavily on the "Virginia Declaration of Rights." This document was drafted by George Mason, another Virginia patriot leader. It was adopted unanimously by the Virginia Convention in Williamsburg in June 1776. It is considered to be a precursor of the Declaration of Independence. It is obvious from reading it that Jefferson was heavily influenced by it when he wrote the Declaration. You can read the Virginia Declaration of Rights here. 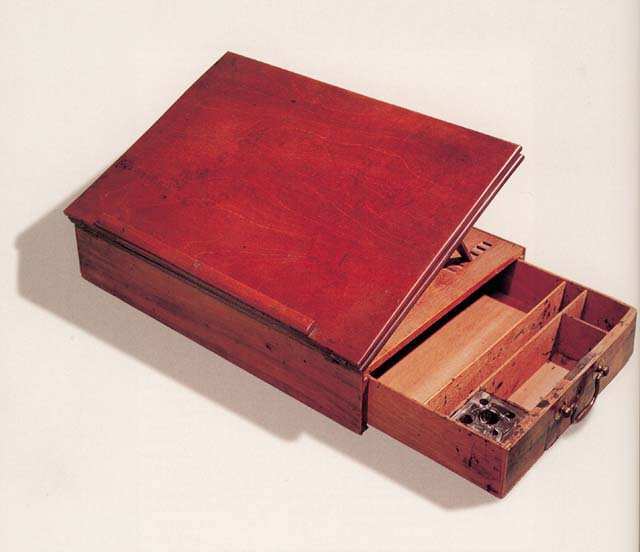 This is the actual mahogany portable writing desk that Jefferson used while writing the Declaration of Independence. The desk was designed by him, but built by Benjamin Randolph, a Philadelphia cabinet maker. Jefferson gave the desk as a gift to Joseph Coolidge, Jr. when he married Jefferson's grand-daughter. It is now in the possession of the Smithsonian Institution. 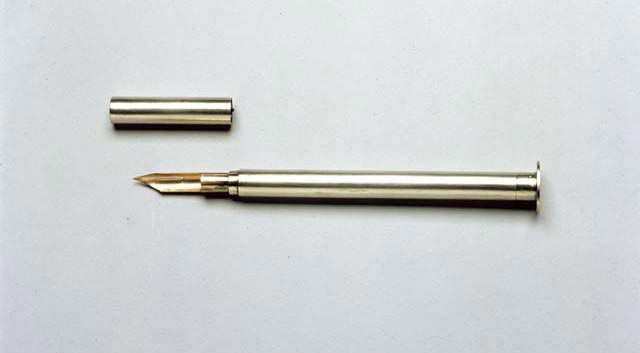 This is the very pen used by Thomas Jefferson when he wrote the Declaration of Independence. It was probably made by Richmond watchmaker William Cowan. 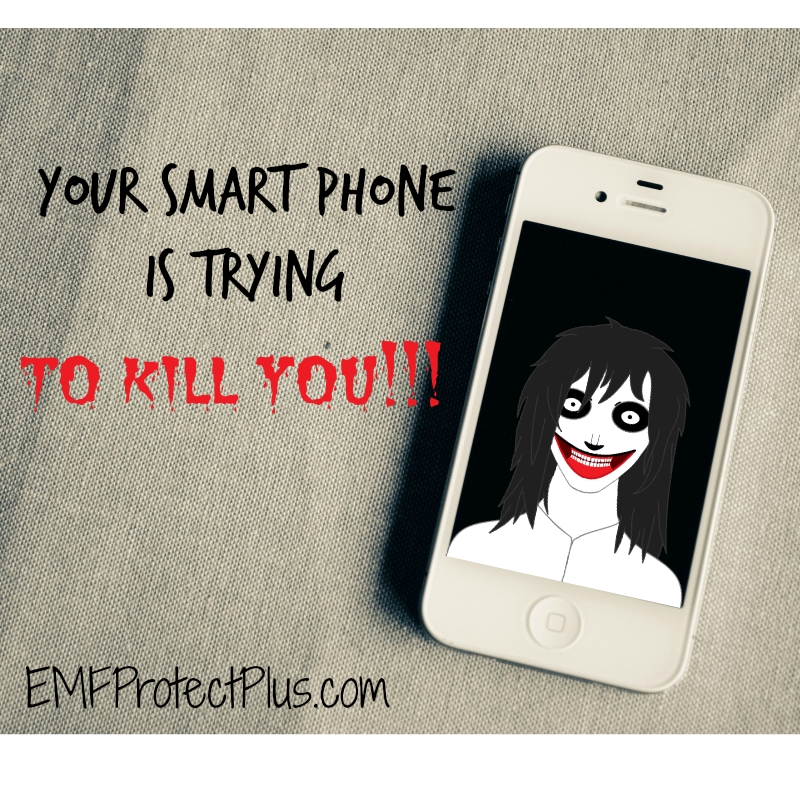 It is in the possession of the Thomas Jefferson Memorial Foundation. Thomas Jefferson wrote the Declaration of Independence in under three weeks. After he was through with the original draft, he gave it to Benjamin Franklin and John Adams, fellow members of the declaration drafting committee, for their comments. You can see here a fragment of Jefferson's own notes while writing the Declaration. 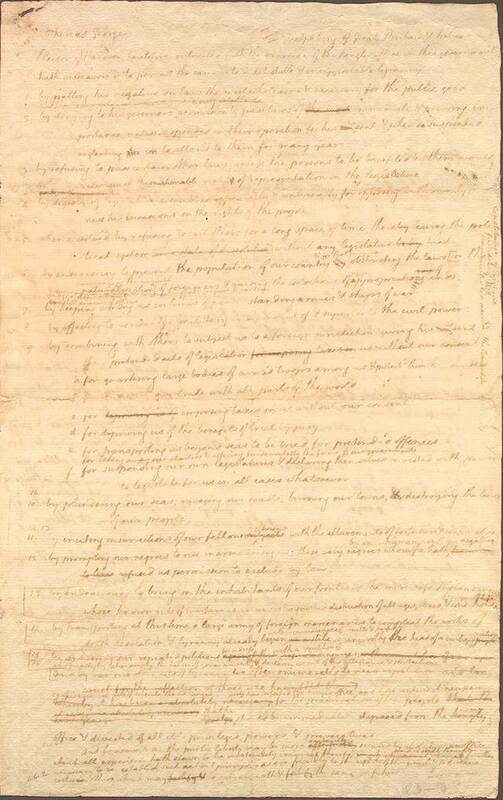 Jefferson wrote out from his notes a version that has come to be known as the "Original Rough Draft" of the Declaration. 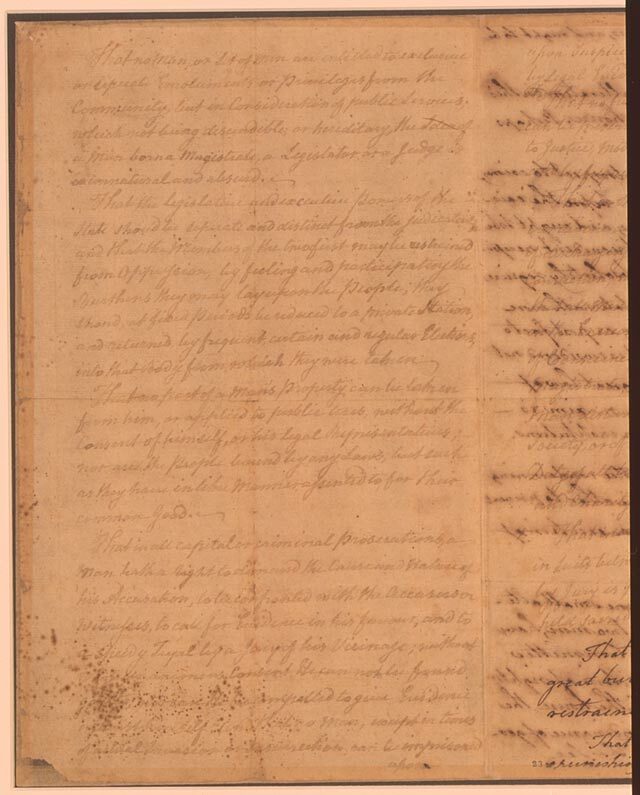 The Rough Draft is the version that contains corrections and changes added by Franklin and Adams. 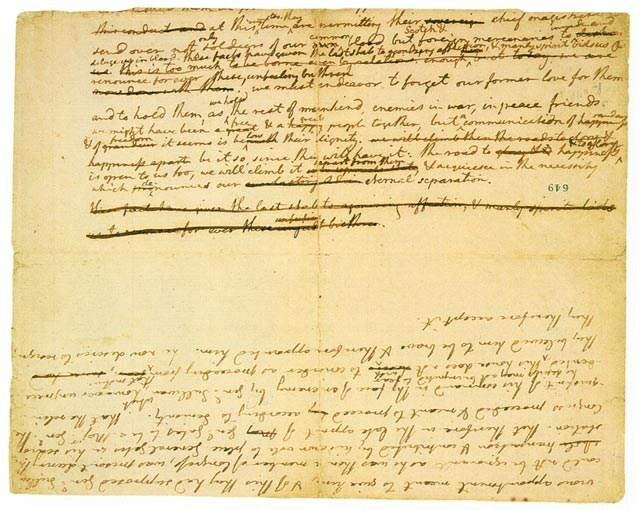 Of the 148 words that are not scratched out by Jefferson on the fragment, all of them appear in the actual Rough Draft, but none of the words scratched out appear in it. On June 28, 1776, a fair copy was presented to and read in Congress. A fair copy means a new, clean writing. On July 1st, the full congress reconvened. The next day, July 2nd, twelve colonies, excluding New York, voted to accept Richard Henry Lee's resolution for independence. This is actually the day American independence was declared, not July 4th, as many people believe. Immediately after voting for independence, the delegates began to examine and debate Jefferson's drafted declaration. They debated the various parts and the wording for the rest of the 2nd, the 3rd and into the morning of July 4th. Finally, after rewording certain parts and deleting others, they became satisfied with the document and voted to publish it as their official Declaration of Independence to the world. The final version of the Declaration of Independence that was approved by the Congress was mostly the same as what Thomas Jefferson had proposed. He did agonize though over some of the changes they made. The two most conspicuous changes they made were to leave out a section that condemned the citizens of Great Britain for not challenging their king for his treatment of the colonists and not standing together with their American brothers and sisters. The congress thought this was too antagonistic and said that their anger was directed at the King and the Parliament and not the people. The second part the Congress removed from the Declaration was a passage that abolished the practice of slavery. At the time, certain southern states where the economy was largely supported by slave labor would not agree to participate with the other colonies if this were to be a condition of joining together. In addition, there were many northerners involved in the shipping of slaves who objected to this. So in the end, the passage was removed, a grievous decision in Thomas Jefferson's mind and the minds of many of the other delegates as well. 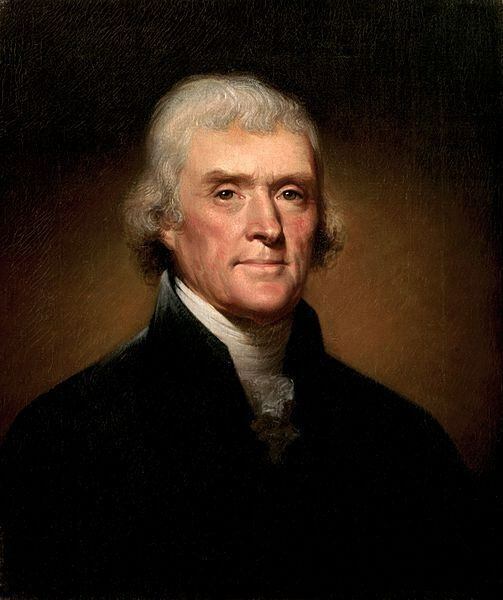 Read the original unedited draft of Thomas Jefferson's Declaration of Independence here. Read the text of the "Original Rough Draft," the version corrected by Benjamin Franklin and John Adams, and presented to the Congress, here. Read the final version of the Declaration of Independence that the Congress approved here. On the evening of July 4th, the Committee of Five followed the Congress' instructions by having Congress' official printer, John Dunlap, print up a few hundred copies of the Declaration. It was then distributed to the patriot leaders and generals throughout the colonies. Thanks to Thomas Jefferson, the Declaration of Independence, America's first founding document is now considered one of the greatest writings and milestones in the history of man! Many years later in 1821, Thomas Jefferson wrote about the experience of writing the Declaration of Independence for future generations in his autobiography. Click here to read the passage by Thomas Jefferson about the Declaration of Independence in his own words.